This was my first time at the Pink Dot. Picnic mats were wide open. Couples were basking in the sun. Friends, who had found each other after jostling around in the crowd, dived into each other’s embrace. A couple of puppies sauntered past me, driving three teenage girls into a moment of ecstasy. And then someone caught my eye – an elderly lady among a group of six. She is the mother of Jason’s boyfriend. The 35-year old Jason is the founder of Grey Projects, an alternative, non-profit arts space and residency. 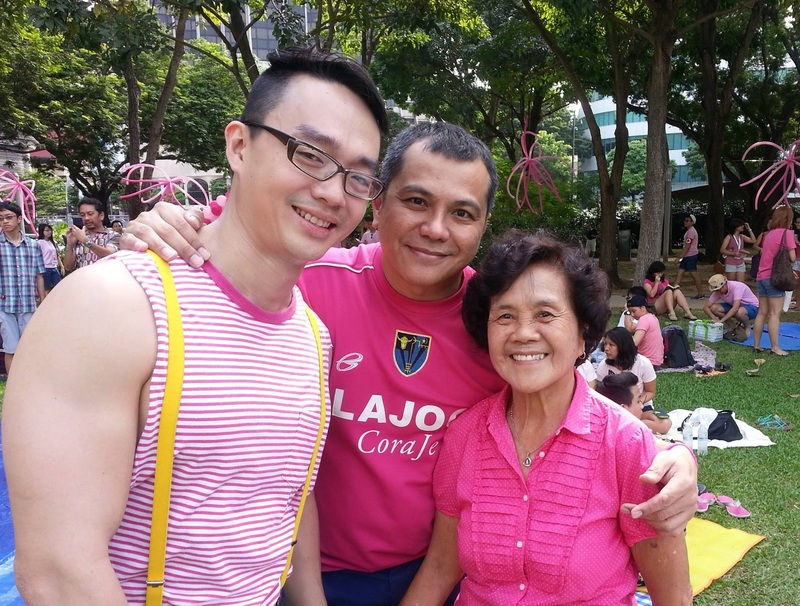 He was there at the Pink Dot with his male partner and his family to celebrate the freedom to love. “It’s really sweet to see couples holding hands, hanging out with their families and babies. It’s very encouraging,” he said. The elderly lady smiled, but did not comment. “If anyone wants to see what family values are about – this is it,” he added. Jason was flanked by his partner, his mother and his nephews and nieces. I could not help noticing that this was a true reflection of familial bliss. Yet, for many members of the LGBT community, getting their families to come to terms with their sexuality appears to be an insurmountable obstacle. Meanwhile, a familiar voice blared across Hong Lim Park. Blogger Mr. Miyagi was invited to give a speech about his experiences with the LGBT community. He spoke about how the gay men in his army days – who were continuously insulted for being effeminate – had ironically turned out to be the most outstanding soldiers. “The best GPMG gun­ner was gay. 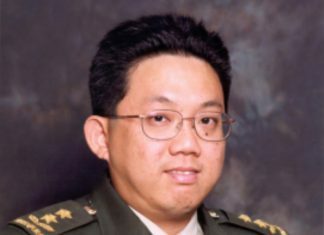 Two of my company’s best pla­toon sergeants were gay, and the guy that broke another soldier’s leg dur­ing unarmed com­bat was one of those chow ah kuas, (a derogatory term for effeminate men)” he said. For years I have shunned effeminate men because I assumed they were gay. I had bought into the stereotype that equates gay men with effeminate behaviour. But here’s the truth: I was not afraid of gay people. I was afraid that being associated with them would undermine my masculinity. I had this misconception because I failed to draw the line between gender behaviour and sexual orientation. Not all effeminate men are gay and not all gay men are effeminate. I am sure there are others who conflate these two concepts – as I did – and they continue to do so because they still lack a clear understanding of the sexual minorities. Or perhaps we have stopped trying to understand, for it is so easy to do otherwise – to succumb to the knee-jerk instinct of applying judgment without a complete understanding of any issue. But the conversation about the LGBT community has begun, and it will go on beyond the Pink Dot. I am straight. You are gay. She is a lesbian. S/he is transgender. What difference does all that labeling make? We all have six litres of blood and a beating heart to remind us of who we really are, deep within – human.